Flexitank designs, manufactures and supplies a range of pillow bladders that are ideal for the static storage and transportation of a range of liquids, including fuel. These Flexitank pillow tanks are constructed from PVC, which provides strong and durable containment of fuel, without the risk of contamination. Each full pillow tank features welded and tested join seems with quality fittings. They have been manufactured to be resistant to both UV and abrasives. Flexitank manufactures these fuel pillow bladders in a range of 9 standard sizes from 1,200 through to 100,000 litre capacities. These standard size bladders are available to order online at the Flexitank website. Due to increasing demand Flexitank is also able to custom manufacture fuel pillow bladders to suit specifications and has recently added a 950,000 litre and an enormous 1,900,000 litre pillow bladder to its range, the first of which was delivered to a client in the UAE in 2011. 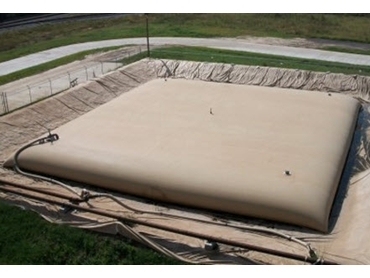 Contact Flexitank to find a suitable fuel storage bladder or tank to suit requirements.